Welcome to this character-rich, open floor plan home nestled in a Fletcher Hills cul de sac w/Mount Helix view! A detached granny flat that includes a new full kitchen and bath is just one of the value features this property boasts. 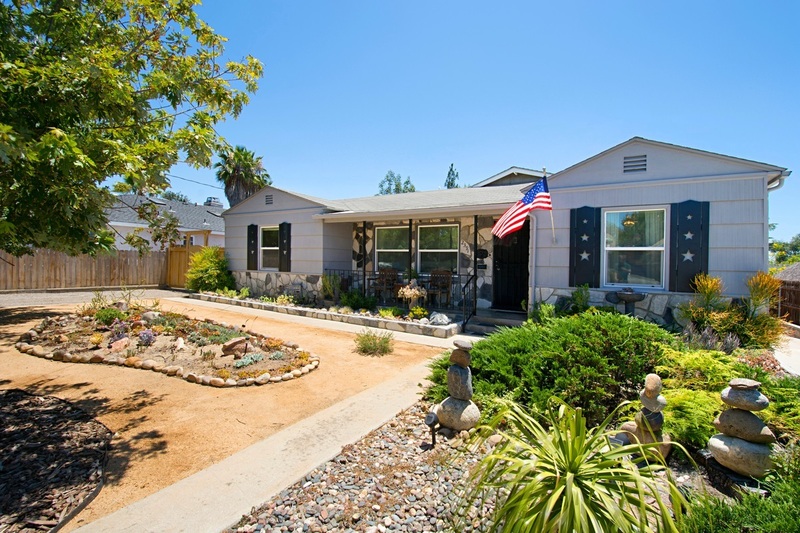 The recently renovated kitchen reflects the era in which the home was built and the sprawling yard on close to a half-acre displays several levels of quaint seating areas, xeriscape gardens and a sun deck! PLUS 2 garages and workshop w/auto pit are a grease-monkey's dream!, Such wonderful history in this unique and beautiful property! The original owner of this home, Clyde Young, was an iron worker who worked closely on this house with Ed Fletcher (the namesake for this community, Fletcher Hills). Clyde wrote stories of the love for his wife, Edna, in the iron railings going up to the sundeck and in initials in the cement here and there throughout the property. He built the granny flat as a place for Edna to run a church school through Faith Bible Church. The outdoor areas are all meticulously maintained and peaceful with the quiet water feature adding to the serenity in the background. From the cool, old castle-like door into the laundry room and mini-gym to the multiple garages (one 2-car and one 1-car that houses an incredible man-cave workshop plus auto pit!) down to the large, level yard below, it is any family's dream! Horse shoes are set up and ready to throw and room for bike riding and treehouses await! A rain water catcher helps to irrigate and the drainage has been carefully thought out to flow well down the different levels of the back area. Main house has 3 bedrooms/2 baths, granny flat has 1 bedroom/1 bath. Although the granny flat is unpermitted, it can be zoned to use as a permitted second dwelling. Inquire through the city of El Cajon to obtain an AZP (Administrative Zoning Permit). Great schools and restaurants are within walking distance. (Fletcher Hills Elem., Parkway Middle School, Grossmont High School as well as Grossmont College. The highly rated Mount Helix Academy is right down the road as well.) There is close proximity to just about everything...freeway access, library, grocery stores plus other retail options like Michael's and Joanne's are right up the street. Lastly, there is a yearly Louise Court party w/ wonderful neighbors as icing on the cake! See Virtual Tour!